Hi, Please help me find my parrot. 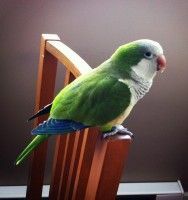 Maziyar (he calls himself Maz Maz) is a 3 year old Quaker parrot, he talks, and responds when somebody call him. I lost him Last night in Lougheed Mall area, some one saw him this morning. he has a band on his foot with the number of [# on file with 911PA]. Please if you have any info even if you ju seen the direction which he was flying will help. My name is Zahra. Thanks for looking and helping Maziyar get home safe to. his family. I pray every night hoping that he will show up soon. I WANT MY BABY HOME, I MISS HIM DEARLY. Pas eu le temps de le publier nulle part donc pas de partenaires à aviser.